On Monday. 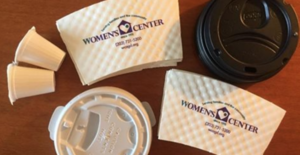 April 23, the Women's Center of Greater Danbury is partnering with local coffee houses and cafes to have them use their custom coffee sleeves to bring awareness of the center and the issue of sexual assault. Visit your local shop listed below and share your photos of their coffee sleeves on social media on Monday. April 23rd. Through these coffee sleeves, WCOGD is hoping survivors will be empowered to seek support and know where to do so. For others, these sleeves are a reminder that WCOGD area free community resource. 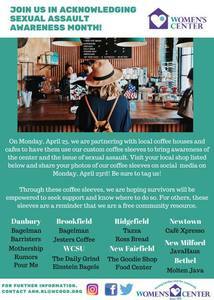 Please visit one or more of these fabulous local establishments to support #SAAM2018 - See attached flyer for a listing by town.